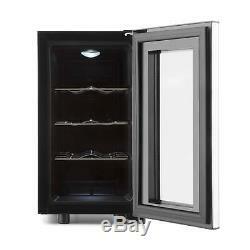 Klarstein Vinovista Picollo Drinks Refrigerator 24l 8 Bottles LED Glass Door Stainless Steel. Slim design: 24-litre capacity for 8 bottles or 16 cans. Easy to use: external touch panel with LCD display. Temperatures of your choice: cooling adjustable by degree from 8 to 18 ° C. Slim design: compact 24-litre capacity mini beverage refrigerator for 8 bottles or 16 cans. Perfect presentation: glass door with stainless steel applications and rounded corners and white interior lighting. 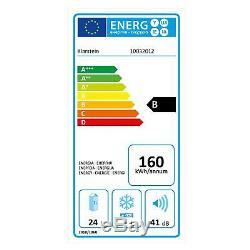 Easy to use: external touch panel with LCD display for temperature and light. Low noise: thermoelectric cooling for extremely low operating noise. Space for 8 bottles (0.75 litres each) or 16 cans (0.33 litres each). Glass door with stainless steel applications. 3 shelves in chromed metal. Door stop: right (not changeable). Temperature range: 8 to 18 ° C (46 - 65 ° F). LCD display for displaying the inside temperature and temperature setting. Temperature display either in ° C or ° F. Cooling: thermoelectric (contains no refrigerant). Drip tray for collecting condensation (located at the bottom of the rear of the appliance). Dimensions: about 26 x 47 x 49.5 cm (WxHxD). Power cable length: about 185 cm. Weight: about 9.3 kg. English user manual (other languages: German). 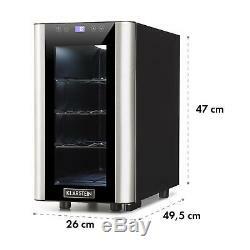 Cool drinks from the compact class: thermoelectric mini beverage cooler with glass door and stainless steel applications with space for 8 wine bottles. Easy operation via touch control panel and LCD display in the door for temperature and light, adjustable cooling temperatures from 8 to 18 ° C. Slim design: compact, stand-alone unit with 24 litres in volume and dimensions of 26 x 47 x 49.5 cm with extremely quiet operating noise. 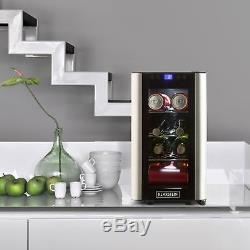 The small refreshment package: the Klarstein Vinovista Picollo drinks refrigerator , with its compact dimensions, cools drinks even where other devices have long since been given up due to lack of space. So not only does it fit into the smallest kitchens, it also ideally suited as a mini-bar in guest rooms, offices or bedrooms. There, thanks to its extremely quiet working noise, it fades discreetly into the background noise and is able to shine with its elegant exterior alone. 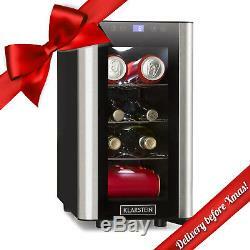 Refresh yourself stylishly, with the Klarstein Vinovista Picollo mini beverage fridge this is no problem. 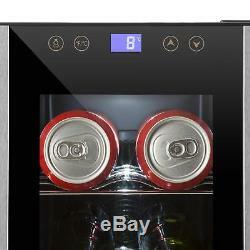 In its 24-litre interior, up to 8 wine or beverage bottles or up to 16 beverage cans (0.33 litres) can be easily accommodated and cooled to desired temperatures between 8 and 18 ° C (46 - 65 ° F). There are 3 chromed metal inserts available. Thanks to the thermoelectric cooling process, the smart mini cooler is extremely quiet and does not disturb sleep, even when located in the bedroom. The touch panel is directly found in the elegant glass door with stainless steel applications, where the temperature and the white interior lighting can be adjusted. The built-in LCD display reliably indicates the temperature in the interior. 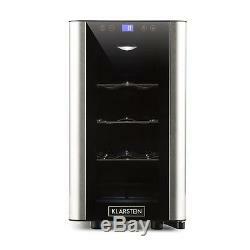 The compact dimensions of the Klarstein Vinovista Picollo mini-bar are especially practical. You can easily find a place for it, even in small rooms: cool refreshment wherever you like! 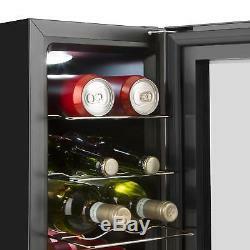 The item "Wine Cooler Mini Fridge Refrigerators 24l 8 Bottle LED Glass Door Steel Bar Beer" is in sale since Friday, December 8, 2017.